Was it the high ceilings, ornate plaster work, and elegant bay window that made you fall for your home? Or perhaps you couldn’t resist the charms of beams and an inglenook fireplace? Maybe it’s the architectural details of another period that created an irresistible pull? Whichever features you’ve inherited in your property, Shutterly Fabulous have put together 7 tips for making the most of their character. Bay windows are beautiful period features and give a home interest from outside and in. A window treatment that emphasizes their shape and proportions is what’s required here, but it needs to work hard too, shielding the inside of the room from the gaze of passers-by, while still letting in precious daylight. The bay window dressing that’s perfect for the job is shutters. 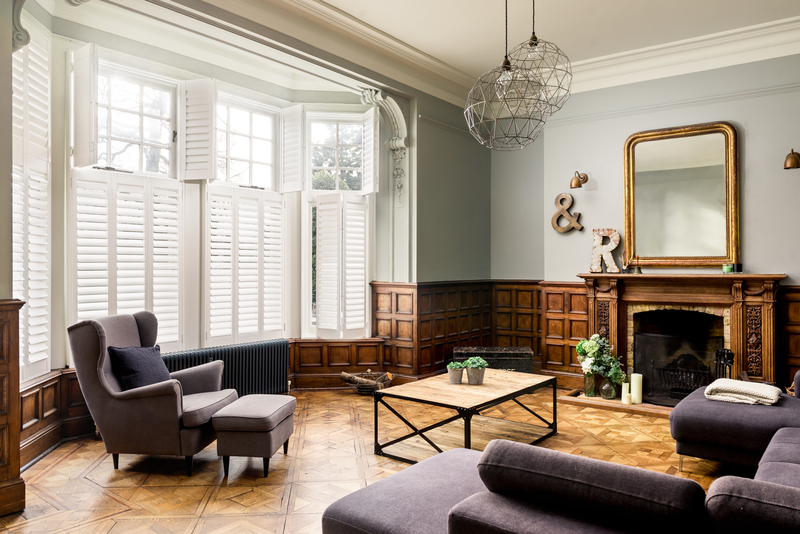 White shutters will maximise light reflection within the room to brighten it, but if the bay window is one of your room’s finest features, why not opt for coloured shutters that will make it even more of an attention grabber? With our custom colour service, you can even choose the hue you love the most as a finish for painted shutters. If original beams are a feature of any of your rooms, don’t let them fade into the background. 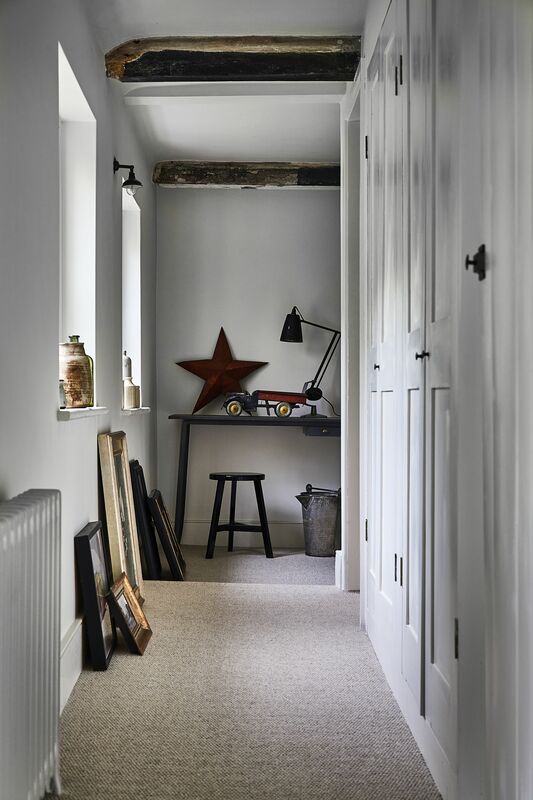 Painting the surrounding walls and ceiling white or stone colours can help make dark beams a more prominent feature – and if yours is a small room with a low ceiling, you’ll also appreciate the space-expanding qualities pale walls bring. Make sure other decorative features don’t stand in competition either. In this space simple furniture shapes that tone with the beams and a rustic-style floor covering leave the original features to do the talking. High ceilings are a cherished feature of Georgian, Victorian and Edwardian homes, and it’s good to draw attention to this dimension of a room. Hanging pendant lights to a low level, whether that’s over a kitchen island, dining table, or as side lights in the bedroom is one way to put the focus on the loftiness of a space. Make sure you choose a light fitting with an attractive cord or chain if you’re employing this strategy – a long length of plastic will do nothing for the room scheme. Pay attention, too, to the final height of the light fitting so it doesn’t block conversation across a table, say, or make it possible that someone tall sitting at a breakfast bar will knock their head on it. Dado and picture rails are elegant features of older homes, and paint’s an easy way to accentuate them. Using white is one way to do it – try contrasting this with a charcoal or deep green or blue on the rest of the wall for a contemporary look. 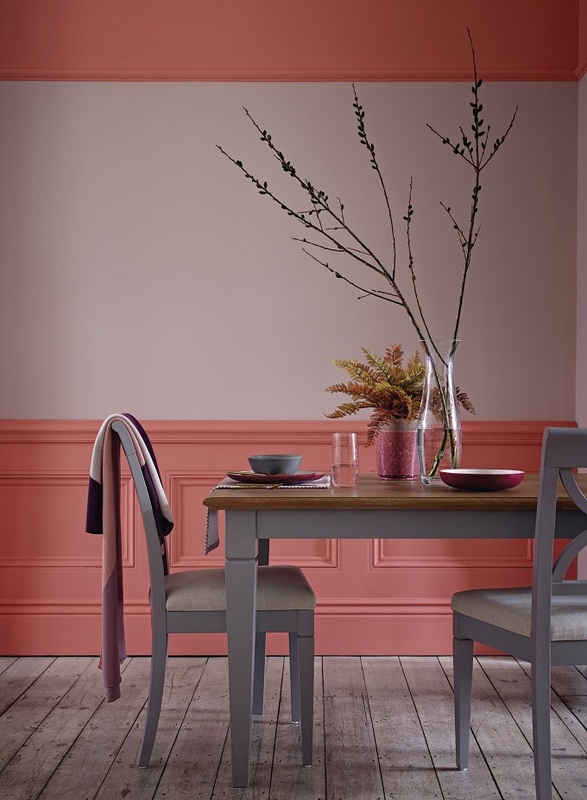 Alternatively, use the same shade below the dado and above the picture rail with a coordinating colour in between, as shown here. Like a more traditional look? Try painting the picture rail and above in white. 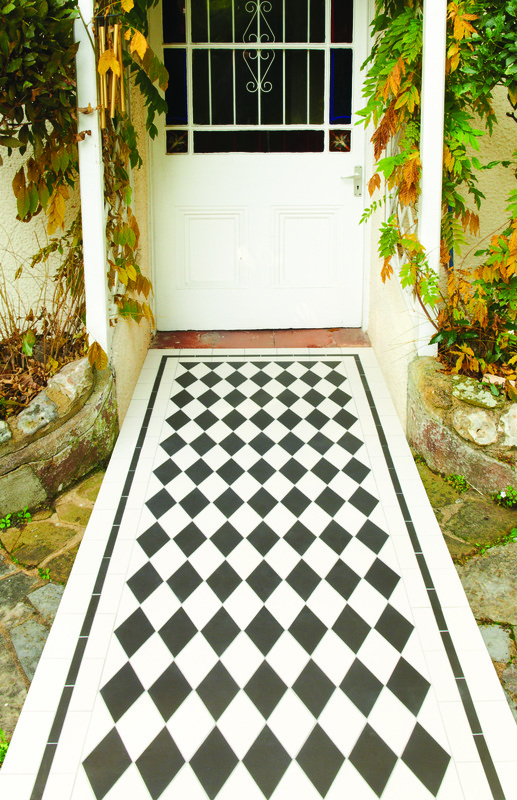 Original tiles leading to the front door may have become damaged and dirty over time, but restoring them to their former glory is a worthwhile project to emphasize a home’s historic credentials and even add value to your home. If the tiles have gone missing or broken over time it’s easy to find historic designs to bring back the period style that’s been lost. Take a peek at the paths of neighbouring homes if you’re not sure what yours would have looked like. The same goes inside the hall. Have a look under the carpet and you may be lucky enough to find original encaustic tiles which can be restored and cleaned – either on a DIY basis, or by calling in a professional. Original fireplaces are fabulous focal points for a room scheme, so even if yours is no longer used, it’s worth making it the central feature of the space. 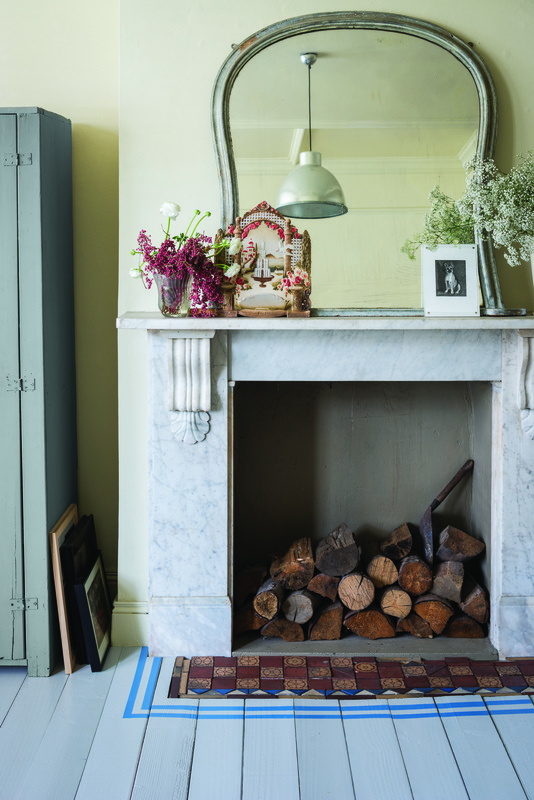 Dressing the mantelpiece is one way to help draw the eye. Hang or prop a generously sized mirror and add decorative accessories. Balance rather than symmetry is the way to go for a modern look – and don’t overcrowd the area. Stacked logs can fill an empty hearth in an appealing way, as can candles, but make sure they’re tall versions or they’ll look lost in space. Lay a rug in front, too, to help make the fireplace the main event, or follow this room’s lead by painting eye-catching stripes in front. Don’t let wall panelling be an unremarked feature of a period home. Colour is the perfect remedy to make it a statement in the room. Try a jewel-like blue, as here, which looks spectacular teamed with gold accessories. Alternatively, go for a dark and dramatic shade and team with a sofa or armchair in a bold colour. After a softer effect? A gentle grey will emphasise the panelling’s detail and marry the old and new in a room perfectly.